Buying a house is considered as one of the top priorities for any individual. At the same time, buying a house is the most time consuming and high energy demanding task of our lives. ‘I bought a house for ‘x’ amount 5 years back. My friend who invested same amount in other sources has earned double than me’, many ask me such questions. What goes wrong while buying a house? 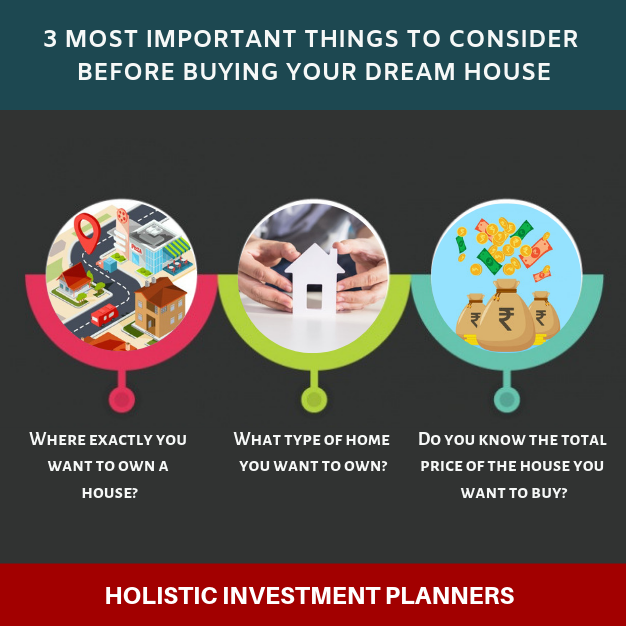 Thought to share a write-up on three important factors you must consider while buying a house. Location is the primary factor to consider before buying a house. Where exactly do you want to live? In an urban society or a rural area? Look at the factors where you can compromise. For example, assume your children are studying in a reputed school which is near to your new home but your work place is quite far. Look for opportunities to move your job near your new home. Or are you ready to travel a bit far for your work? List down similar factors and choose the best combination before buying a house. Remember, Safety is very important. Check whether you have public utilities like hospitals, police station or fire station nearby, so that you are safe during any emergency. Money decides everything in our day to day life. The second most important thing is the money you want to allocate for investing in your new home. Check the purchasing price. You must analyse the impact it will create on savings that you have as of now and other expenses you do every month. Your job or earning power is very important to be considered while budgeting. Do you have a permanent job or steady income? If not, analyse how purchasing a particular home will affect your expenses if you do not earn steadily for a particular period. Normally, we assume that the price of the property is the total price. If you are buying a loan, adding the down payment, interest and the total price of the house will give you the total price. You can calculate the monthly payment as well from the total price. Check the total price of the house whether it will have net worth in the long time. If you want to sell your house at any point in the future, you must know the approximate price you will get. To forecast it, check the purchasing price and the current value in the neighbouring properties. If the difference is good enough, you may very well know that your house will also fetch you good return in the long run. However, you must understand that the builder reputation, size of the house may raise some concern though in the future. Have you been dreaming to own a house like Tamil poet Bharathiar? A house with pretty pillars, a pond, 10 or 12 coconut trees, moon light shining like a pearl, soft song of nightingales with a cool breeze to make you happy. A separate house with your own garden and privacy will sure make you happy. At the same time, you must understand the responsibilities it brings in. You are solely responsible for the maintenance and repair works. If you are ready to take this responsibility, you are all set to go for a villa or a separate house. Apartments come with lesser responsibility compared to villas. You will be sharing the common space with others apart from owning your living space. Even though maintaining the overall property is taken care by the home owner associations, you have to pay a share of overall building maintenance. Most of the apartment complex associations will have control on the changes you make to your house. Some important questions to add in the checklist before choosing your dream home. a. Is the location appropriate for me and my family to commute to work, school, public utilities? b. Can I afford this property? Will I be able to maintain the same lifestyle after paying for the house? c.	Do I need a villa? d.	What disadvantages do I have in owning a villa? e. Will I be happy in this apartment? f.	What is the maintenance fee involved in my house? g.	Can I afford the monthly expenses after owning this house? There are gated communities with villas, apartment complexes built by the reputed builders nowadays. Check for the monthly maintenance fee associated with living in such communities. At times, you end up paying huge sum periodically to maintain the overall community and security. Can you afford it? Think multiple times before investing. Previous Previous post: How to Control Risk and Reap the Rewards from your Investments?